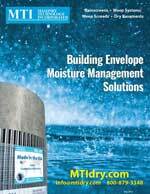 MTI – Masonry Technology Inc. – specializes in moisture management at all levels of the building envelope. Whether you are looking to manage moisture in a rainscreen application, weep the bottom of a masonry wall, dry out a wet basement or handle moisture in a roof detail, we can help. MTI's patented “True Channel’ rainscreen drainage mats and “Tunnel Weep” products are the technology leaders in the moisture management industry. Floor EdgingTM and Control CavityTM keep basements dry without the “call back” headaches. With MTI products and expert assistance, you’ll be MTI Dry! MTI "True Channel" rainscreen drainage planes get the water out of walls faster for a more sustainable building. MTI "Tunnel" weep technology puts the weeps at the true bottom of walls - where the water is! MTI basement moisture management products have been keeping basement living spaces dry for over 25 years. MTI offers a variety of solutions for new basement construction to keep your below-grade living space dry. MTI offers a variety of basement retrofit solutions to keep your below-grade living space dry.